Help make sure your facility isn’t unknowingly exposing patients to dangerous infections. 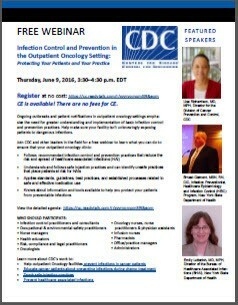 This webinar is a must-see for every doctor, nurse, and health care provider who works with cancer patients. understands and follows safe injection practices. CE is available! There are no fees for CE. View Webinar invitation here: http://1.usa.gov/1TSPs4w.